Movie Review: ‘YOU WERE NEVER REALLY HERE’ – it’s hammer time! Diving deep into Lynne Ramsay’s long-awaited follow up to 2011’s WE NEED TO TALK ABOUT KEVIN, YOU WERE NEVER REALLY HERE, is like looking inside the memories of a broken human being. It’s a film that isn’t going to get faint praise from anybody. You’re either going to lap up he horror Ramsay shows, or detest the fragmented narrative beats that are willfully absent from the screen. Featuring a sturdy lead performance from Joaquin Phoenix, these artists leave enough to speculate for many years to come. Joe (Phoenix) is a man who makes a living tracking down missing girls. He has a moral compass, but seems completely bored with his existence living in the heart of New York City. Joe is merely surviving in an old brownstone where he lives with his mother (Judith Roberts). When he’s drawn into a trafficking conspiracy, he lumbers into the darkest sides of human nature. Ramsey only gives us glimpses of Joe’s past violent transgressions. He’s clearly traumatized, but Ramsay trusts her audience to come along for this painful ride. This is a scrappy ode to dirty detective stories that act as stylish mood pieces and true works of art. The ambition is nothing new for the filmmaker, but YOU WERE NEVER REALLY HERE is executed with an archer like precision that pierces your senses. As a screenwriter and director, Ramsay doesn’t waste a moment; scenes are ended quicker than you’d see in a traditional narrative. Its an experiment that only a filmmaker at the height of their powers could execute. The uncompromising vision comes in at a lean 90 minutes. We’re given an expressionistic look at a person that could either be a tormentor, or a savior. Phoenix plays Joe with a physicality that looks like he’s come off of a three day bender of whiskey, Percocet and cheeseburgers. We’re never quite sure if he’s on the way to his deathbed, or to a place of enlightenment. YOU WERE NEVER REALLY HERE beautifully blends the visual and aural power that cinema has to offer. Thomas Townsend photographs the film like an adrenaline rush. You’re not sure what to believe, the images are jarring and frantic, and it’s nearly impossible to stay lucid. Yet Townsend, Ramsay and editor Joe Bini slow down to the frame to capture every piece of horrific beauty. Matched with Johnny Greenwood’s score (PHANTOM THREAD) that acts as a wallpaper of sound design and mood to be just as affecting as the haunting visuals. Ramsay leaves much to be desired narratively with her take on the neo-action genre. This story takes place in the heart of America and has a distinctly European feel to its execution, a style that has been perfected by the likes of Nicolas Winding Refn (DRIVE). Ramsay plays with idea that happiness and trauma are closely related emotions, each one frothing at the brim and just waiting to boil over. 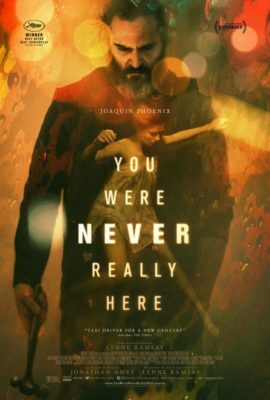 YOU WERE NEVER REALLY HERE isn’t a film that will give you traditional satisfaction in a way that feels natural. There’s something to be appreciated for a director with a concise vision. Ramsay uses a template to show us something familiar and turns it around into a fragmented filmgoing experience that’s more about the journey than something that provides a hopeful destination.